How I get my Curls! The most frequently asked questions that I receive are almost always about my hair. To be honest I find this so flattering as there are times that it just won't behave and can drive me mad! Finding the right products to suit your type and texture of curl is most important. This can take time, patience and money. Your product choice may also depend on the type of look you hope to achieve. For me, the perfect curly hair day means having lovely spiral curls with plenty of volume at the roots. My hair is actually quite fine, which means I cannot afford to grow it too long or the curls can really drag. I personally find that curls are quite complex and temperamental. The typical curl scenario is that you'll have the best hair day ever when you have nowhere to go!Finding the right products that work for your curl is a very personal journey that evolves over time. Often what might work for my hair may not work for yours. That said I really hope that you find this post helpful and have time to give me some feedback about what products you find successful. I only use Deva Curl No Poo(Shampoo) and Deva Curl Conditioner every second or even third time that I wash my hair, as I find it goes quite limp if I use (shampoo and conditioner) product for every wash. My best day for curls is when I just completely soak my hair but don't use products. Directly after washing my hair I wrap my hair with a 100% cotton cloth (usually just an old t-shirt or a muslin cloth). I don't use a towel as it absorbs too much water out of the hair ad introduces frizz. I find it's better to keep your hair VERRY wet before you put the styling products in. When possible, I try not to brush my hair after washing it. However, when I don't use shampoo and conditioner I have to give it a quick brush as it can get quite knotty. I trend to brush mine directly after washing it. a. I start by putting 3 squirts of the Deva Curl Miracle Curl Plumper (Texture and Volume) product into my hair. I rub it betweenpalms and apply it generously from root to tip. I think this is great for adding volume and shine. b. For me, this is the most important stage. I have been using the Umberto Gianni Curl Whip Mousse for years and I think it works best for my curls. I have tried others products throughout the years but I always end up going back to it! I generally use three large handfuls of mousse. I apply it generously at the root and pull it through to the end. Turn your head upside down and scrunch the excess product out using your muslin cloth. c. Then I use 3 squirts of the Deva Curl Ultra Defining Gel. Rub the gel between palms. Tilt head forward then scrunch gel all over very wet curls. d. Once the hair is soaked with products (then) turn your head up side down and use the muslin cloth to scrunch up the curls. Again it's important not to use a towel here as I think it absorbs too much of the product and introduces frizz. 5. Pinning My Hair Once you have finished scrunching your curls, it's time to pin it up using the claw clips(these can be purchased in Boots, Penneys, H&M etc). This is an important stage for me as I need plenty of volume as I have fine hair. This isalso handy if you don't fancy scrunch drying your hair straight away. I often repeat this stage after my hair is dry to create even extra volume. When pinning your hair, divide your hair into 8/10 sections and roll the curls into individual sections and pin it to the scalp using the claws. 6. Drying My Hair I use a diffuser dryer called Babybliss. I bought it in Boots pharmacy for about €40 and it seems to do as a good a job as any! I generally put it on full heat and full power. I personally don't like the look of jelly curls (i.e curls wet with product) so it's important to me to fully dry out my hair so there is no look of product left in the hair. While drying my hair my head is usually upside down to introduce volume. 7. After Drying My Hair I often repeat Step 5. using the claw clips to pin up my hair gives it even more volume. 1. The claw clips are the best way to achieve a spiral curl and add volume to a curly head. 2. Use the claw clips at night to pin up your curls, sometimes day 2 or even day 3 are even better hair days. 3. Don't use a towel to dry your hair, use a cotton t-shirt or a muslin cloth. 4. Avoid using shampoo and conditioner each time you wash your hair! Unless you have invested in the Deva Curls No Poo. 5. Go to a hairdresser that understands curls! I go to Laura at Raymond Skelton in Galway. I think it's best to cut curly hair when it's dry and curly! 6. Fully dry your hair so there is no evidence of the styling product as to avoid jelly curls! 7. Once a week use the Umberto Gianni intensive conditioning treatment. 8. I currently USE Deva Curl No Poo and Deva Curl Conditioner. But I also found the L'Oreal Elvive colour protect shampoo and conditioner good. 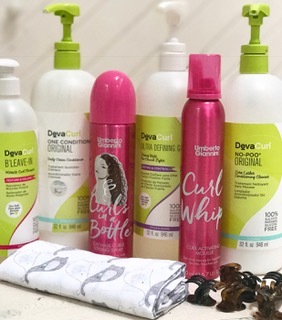 Most shampoos contain dehydrating detergents, Deva Curl offer a non-lathering shampoo alternative. Unfortunately it's only available in the US but it is possible to buy online through Sephora.com. I hope you find this post helpful and have time to give me some feedback about what products you find successful.